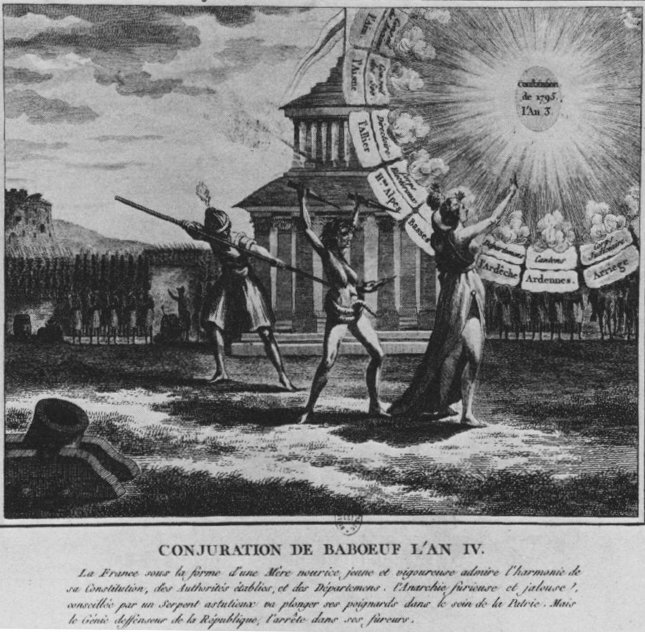 On this date in 1796, 30 Jacobins were shot by a military commission in under the French Directory for attempting to subvert the army. This final, failed enterprise of Gracchus Babeuf‘s “Conspiracy of Equals” took place months after Babeuf himself had been arrested on the eve of his envisioned revolution. May the reign of the brigands fall! The sun shines for all. Spread alarm to grinning crime. And leave the darkest night behind. In the uncertain aftermath of Robespierre’s fall, the interregnum of the Directory saw both royalists and republicans jockey for a restoration of their former prerogatives (and jockey against one another, of course). Babeuf’s conspiracy might have been the boldest stroke of all had it come off; instead, a projected rising for May 11, 1796 was scotched by Babeuf’s pre-emptive arrest. But to strike the head was not to slay the movement. The economy was a mess and the political authority a rudderless, unpopular clique. The coup attempt didn’t happen but Jacobin agitation continued to mount — met in its turn by royalist agitation, the two parties dangerously hellbent for one another’s blood. The imprisoned Babeuf (he wouldn’t be guillotined until the following year) made one such focus of agitation — and eventually, of more conspiring. On the night of September 9-10, several hundred armed Jacobins assembled and descended on the camp of Grenelle — intending not to fight, but to fraternize, hoping that sympathetic soldiery could be swung to liberate Babeuf and mount a rising against the Directory. This strange and desperate episode was in the end the acme of babouvisme, and was crushed out of hand by officers of the regiment. Most of the would-be fraternizers scattered but 132 were arrested. At snap military trials — legally questionable since most of the instigators were civilians — 33 death sentences were meted out. Three were delivered in absentia; the 30 others were all enforced by musketry on this date. 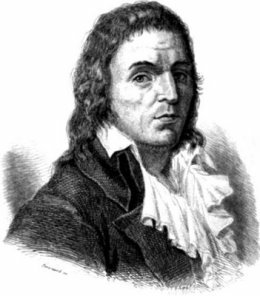 Antoine-Marie Bertrand, the former Jacobin mayor of Lyon — the very man toppled by the moderate uprising whose lethal consequences we have previously visited in these pages. More about Babeuf, “the first modern communist”, by the speaker in this lecture here. * All three had in their day voted the death of King Louis XVI. 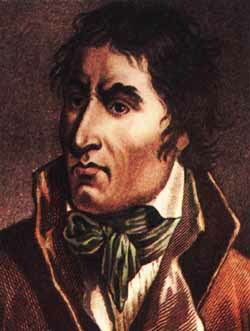 On this date in 1794,* a revolutionary Montagnard who had overstayed his welcome made his departure through the guillotine’s window. Carrier (English Wikipedia entry | French) was the Revolutionary Convention’s proxy in Nantes where he distinguished himself in bloodthirstiness while putting down a counterrevolutionary revolt. He’s most particularly noted for the Noyades de Nantes, a series of mass drownings in the Loire that claimed two thousand or more victims — mostly priests and civilians viewed as refractory. Overall the casualties in the Vendee ran to six figures; there’s been latter-day debate over whether the Republican policy there rose to the level of genocide. Les noyades de Nantes en 1793, by Joseph Aubert (1882). Now, one could author a bloodbath in the provinces and still stick around for posterity, but that play depended on a timely volte-face with the Thermidorean reaction. Unlike Fouche and Tallien, Carrier couldn’t pull that off. He was left in an increasingly untenable position after Robespierre fell. What would follow Robespierre? Carrier’s own person and the Noyades de Nantes were central to this question in the tumultuous latter half of 1794. His beheading would be the climax of a string of pivotal trials. The atrocious stories from Nantes promulgated in Paris by these first trials soon had the city in an uproar and dealt the already-reeling Jacobins “a terrible blow in public opinion” according to one newspaper also quoted in Gilded Youth. The Nantes revelations would provide the impetus (or the pretext) for the riots that soon shuttered the Jacobin Club and placed the Parisian bourgeoisie firmly in control. If Carrier was the casualty in all this, well, he wasn’t exactly in a position to complain about being sacrificed for someone’s ideology. Gracchus Babeuf, later to drop his own head into the basket, campaigned against Carrier furiously during a robust pamphlet war. they’ll justify the mass killer of the west with the excuse that the terrorism he provided the earth an example of was necessary for the salvation of the Fatherland. In order to save the Fatherland were the 23 noyades of Nantes, one of 600 children, needed? Were “republican marriages” necessary, where young boys and girls tied together naked were knocked unconscious with saber blows and then tossed into the Loire? 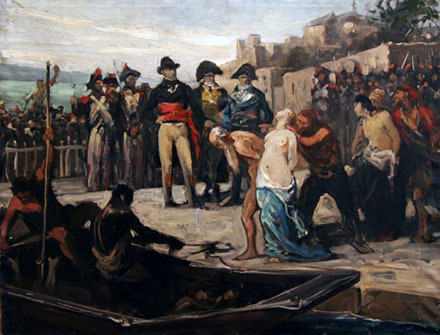 (Deposition by Philippe Tronjoli and Bourier) Was it necessary (another deposition of 25 Vendémiaire) to cause to die in the prisons of Nantes through hunger, infection, and misery, 10,000 citizens, 30,000 if we include the executions and noyades? Were the sabrades necessary (deposition of Laéné) on the departmental square, which occupied 300 men for six weeks filling the mass graves with those who perished from this torture? Was it necessary for Carrier (deposition of Tronjoli of the 27) to sleep with three beautiful women and then drown them? Was it necessary to execute (deposition of Renaudot) infantry and cavalry detachments of the rebel army who had voluntarily surrendered? Was it necessary to drown or execute (deposition of Thomas) 500 children, the oldest of whom wasn’t fourteen and who Carrier called vipers that must be suppressed? Was it necessary (same deposition) to drown 30-40 women eight and eight and a half months pregnant and to offer horrified eyes the still palpitating corpses of the babies tossed into a tub filled with excrement? Was it necessary (deposition of Abraham and goodwife Puchotte) to kill in one night by suffocation (caused by infection and lack of air) 50-60 prisoners in a galleon whose side panels were shut expressly to cause suffocation? Carrier’s likeness is preserved in wax at Madame Tussaud’s.